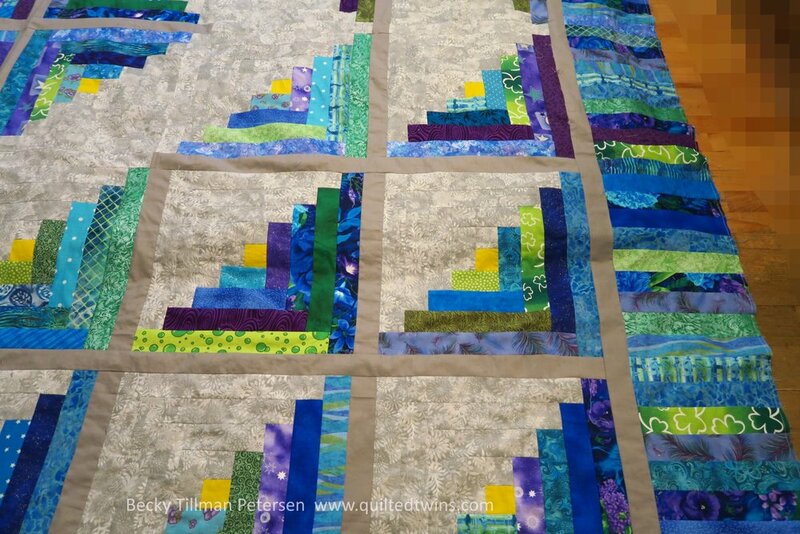 My niece has requested a log cabin quilt, laid out like the one I made called Cabin Fever Blues, but using a variety of purples, greens, and blues. She even sent me the fabrics a year ago when my sis visited, so I had no excuse not to get the colors right! The biggest problem was that she wanted a king size quilt and the one I had was only a queen. I decided to make the borders quite a bit bigger to make it the size I needed - and try not to think that such long piano key borders looked weird. I figured once they were draping over the edges of the bed, they'd be fine! I had tried to lay it out by adding another round or two to the log cabin design, but it lost its 'wow' factor by doing that. In the end, I'm pleased. I like the whimsical little log cabin blocks I used in the corner blocks of the border as well. In order to make these work size wise, I made the outer round of strips 2.5" wide instead of the normal 2" wide cut. They sent me the fabrics a year ago, so I wasn't too worried about using the wrong colors! Actually, I went to actually cut it out a while ago, though, and found I was about a yard short on the gray - so Rachael stuck another yard in an envelope and mailed it to me! Thankfully it's one of the of the fabrics she carries all the time - (Gray Packed Floral) and it's only $3.99/yard every day! By adding the piano key border, it is as if you add a whole lot of impact colorwise. I'm glad I made them as big as I did because I like the slam dunk color that hits you in the face when you look at it. The pattern is already over on the free patterns page. Of course it's a classic log cabin with a tiny bit of my own addition to it! I'm not writing up another one for this variation. If you wanted to make one of those to be a king size (this one is now 107.5" x 107.5") just do like I did. Be sure to check out what my sis has for you over in the store! She's always working hard to get you new and fun fabrics for your quilting experience! This fabric features bees, honeycomb, and other bugs along with some of the Beatitudes ("Bee-atitudes") from Matthew 5. Oddly, the verse reference included on the fabric is Matt. 3:6, which is unrelated. White with lime green shading on black. This fabric features bees, honeycomb, and other bugs along with some of the Beatitudes ("Bee-atitudes") from Matthew 5. Oddly, the verse reference included on the fabric is Matt. 3:6, which is unrelated. Words with definitions on it as shown. The selvage says "Tidings of Great Joy" but this is a sewing fabric. In fact, it has a red pin cushion, complete with lots of pins on tags with buttons lying around on a background of creamy white. It has nothing whatsoever to do with Christmas. The fabric is named, "Oh, La, La"
We put it into the Sewing Category because we have Clothing and Sewing together.. and shoes fit better as a part of clothing than anywhere else.